Are you planning a Caribbean vacation? So, which places you expect to visit once you are there? What all you want to do? Or, in simple words, what is your dream Caribbean escape? Whether it is St. Croix in the Virgin Islands, Aruba, Barbados, Bonaire, or St. Marteen, your Caribbean Islands vacation may include several fun-filled surprises and awe-inspiring delights. It is truly a paradise, full of white beaches, shallow coves, and azure waters. But, how to choose the best of the best? Each spot is stunning in its own right, but these five are the best Caribbean island vacation spots, with some of the best beaches on the planet. Aruba — Aruba is a vacation destination for all as it offers a multitude of activities for people of all ages. At one hand, it is very family-friendly, with numerous resorts catering to families with kids, while on the other hand, it has bustling nightlife including outstanding casinos which make it a perfect destination for adults. With more of a desert appearance rather than forests, Aruba includes many stunning hidden beaches. Anguilla — Better than tranquil and more relaxed than laid back, Anguilla’s vibe is cool-without-trying. No majestic volcanic mountains. No hustle, no bustle. Calm! Anguilla is home to some of the world’s best beaches, award-winning resorts, hotels, and villas, and a rich cultural heritage, making it one of the leading destinations of choice for discerning travelers. Barbados — Among all major Caribbean vacation spots, Barbados, a magnificent coral island, is the best for nature lovers. It is situated in the East Caribbean Sea. While the glittering beaches are great, you will be blown away by everything else Barbados has to offer as well, including a capital city heavy on history and legends, a buzz-filled nightlife, and a vibrant local culture. Jamaica — Jamaica lures a lot of travelers of many different types. Some come to witness the amazing flora and fauna, including many exotic species of birds. Others come to experience the famous Reggae music scene, which has its birthplace on this island. From year around warm weather to the locally sourced cuisine, there is so much to enjoy on the island. La Romana — This beautiful port possesses a beauty that is hard to resist. Different shades of turquoise waters lapping against the fine sand of the beach with tons of attractions and great for some spectacular vacations. Delve into the deep blue sea. Stroll through a Mediterranean villa. Window-shop in art galleries. Set sail and fish from a yacht. Attend a concert or bask in the tropical sun on the incredible beaches. Now all you have to do is stock up on sunscreen, find the perfect sun hat, pack your bags, and book Apple vacations which have all-inclusive deals to make your escapade comfortable as well as stress-free! 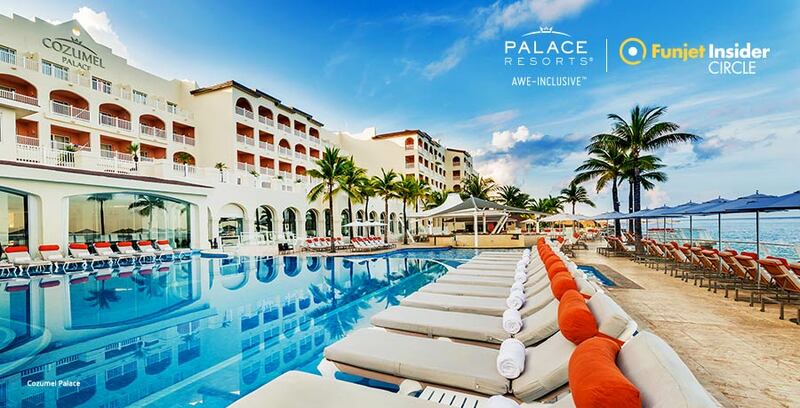 Palace Resorts: Up to $600 in instant savings. Enjoy up to a $1,500 resort credit + kids & teens stays included.